GOLDEN GARDENS is having a work and planting party on the 8th (this Saturday). It happens from 9 a.m. to 12 noon; meet at the dog park parking lot on Seaview Ave NW. Contact Doug Gresham at doug@greshamenvironmental.com for further information. CARKEEK PARK is having a work party on the 15th. It happens from 9 a.m. to noon as well. Contact dalerayjohnson@comcast.net for meeting place and further information. In both cases, tools, gloves, and guidance will be provided. Wear weather-appropriate layers that can get dirty, and bring your own water and snacks. Our first work party. Photo by Drexie Malone. North Beach Park work parties will return on January 26th. Save the date! We’ll be planting some trees and plants provided by Swansons Nursery’s Trees for Salmons program. There are a lot of details still to be worked out, but the date and time are set! 2012 was a great year for North Beach Park. We had nine work parties, three visiting grade schools, UW ESRM 100 students, two major planting parties, two more forest stewards, and a separate project in the South Plateau working with young adults living in the Labateyah Youth Home. 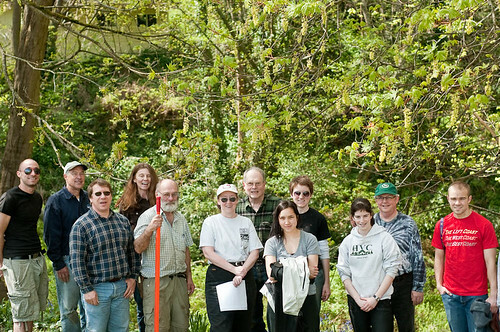 We also got fiscal sponsorship from the Seattle Parks Foundation, and received a microgrant from Groundswell NW. You can support North Beach Park by making a tax-deductible donation to the Seattle Parks Foundation, and directing it to North Beach Park. Go to their donations page, and select “Friends of North Beach Park” from the Donation Designation drop-down box. Any money raised will be used to hire a natural area crew to work in the areas too steep for volunteers. As we learn more about North Beach Park, from stewarding it, working with its neighbors, and studying its ways, our appreciation deepens. We hope you can join us in 2013, and we are thankful for your support in 2012. 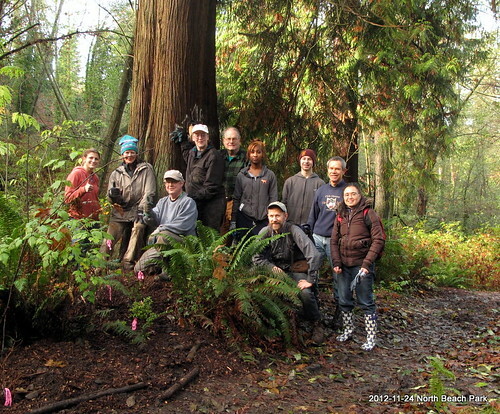 November 2012 work party. Photo by Keelin Curran.